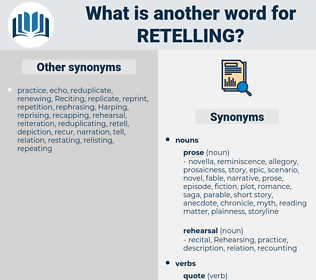 What is another word for retelling? be quiet, take, ask, question, keep, conceal, suppress, misrepresent, fail, withhold, confuse. The materials for the retelling of this story are very slight. But when Green Valley heard how the minister got acquainted with Frank Burton Green Valley laughed and laughed and forgot to eat its meals in telling and retelling it. 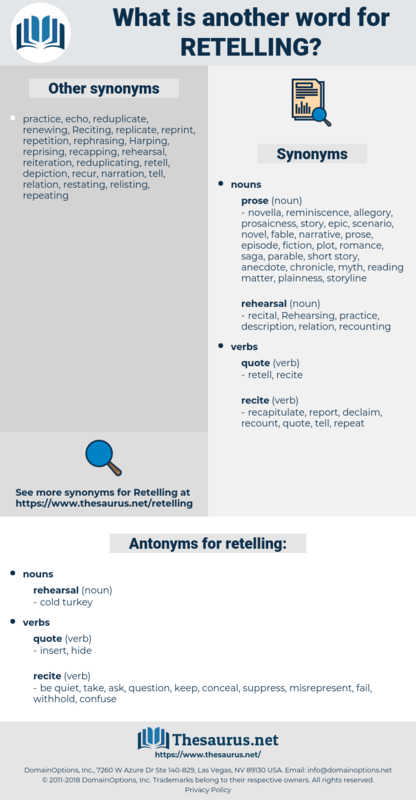 retail, radial, rudely, readily, red willow, rotl, ratel, rattle, raw deal, riddle, ridley, rowdily, roridula, rutile, redtail, rattail, ruddle, rootle, retool, ritually, rathole, Reddle, raddle, rodolia, ritual.